Dr Himanshu Garg is an experienced Respiratory, Critical care & Sleep disorders Physician with expertise in disease conditions like Asthma, COPD, Tuberculosis, Pneumonia, Sleep Apnea, Respiratory failure Sepsis etc. He has been extensively trained in India and Australia. He was entrusted with the responsibility of setting up Respiratory & Sleep Medicine service at Medanta- The Medicity one of the largest facilities in this part of the world. He is one of only few physicians outside of North America to be certified in Behavioural sleep Medicine by American Board of Sleep Medicine. He is playing a pioneering role in the emergence of sleep medicine in India and the region and working towards developing training pathways and curriculum pathways in sleep medicine. He was instrumental in setting up of first sleep lab in Nepal. 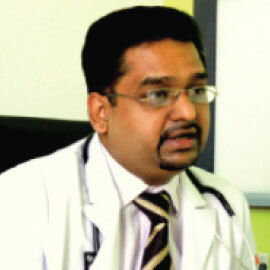 He is the founder of South East Asian Academy of Sleep Medicine. He is currently heading the Respiratory Critical care and Sleep Medicine service at Artemis Hospitals.He is also the Director at Respiratory and Sleep Cure Solutions, Gurgaon. MBBS from Dr. S.N. Medical College, Jodhpur, INDIA in Oct., 1998. Internship from various hospitals attached to Dr. S.N. Medical College, Jodhpur, INDIA in Jan. 2000. Three Years Post Graduation in Respiratory Medicine from S.M.S. Medical College, Jaipur , INDIA in June 2003 to obtain MD. Clinical Fellowship in Respiratory & Sleep Medicine at the Western Hospital, Melbourne(Australia) in 2007. SMS Medical College Jaipur (MD). Riyadh Medical Complex, Riyadh Saudi Arabia. Royal Hobart Hospital, Tasmania, Hobart, Australia. Launceston General Hospital, Launceston, Australia. Life member Indian Chest society (ICS). Fellow of the American College of Chest Physicians (FCCP. Member governing council Indian Sleep disorders association (ISDA). Member American Academy of Sleep Medicine (ASSM). Recently re launced the Respiratory Critical Care & Sleep Medicine Service at Artemis hospital which is a 350 bedded JCI accredited flagship hospital of Apollo tyres conglomerate. The department is gaining acclaim as the major training and teaching and referral hospital for Respiratory & Sleep Medicine. Senior Consultant Respiratory & Sleep Medicine Medanta- The Medicity in Gurgaon. I was entrusted with the responsibility of setting up the department of Respiratory & Sleep Medicine in one of the largest healthcare facilities in this part of the world. I was responsible for running of the Pulmonary function lab, Sleep Lab, Non Invasive Ventilation Service and Bronchoscopy. I am responsible for providing Pulmonology back up across 7 ICUs in the hospital. I initiated first of its kind fellowship in Respiratory & Sleep Medicine in association with the Western Hospital Melbourne & MSDC Australia. Consultant Respiratory & Sleep Medicine Max Healthcare, Saket New Delhi. This is one of the largest tertiary care corporate hospitals in the National Capital region. I was in charge of respiratory diagnostics & Respiratory critical care referral work. I initiated weekly journal club meetings of the department. I was responsible for launching a formal Sleep service at the Max hospital Saket. Reporting of sleep studies and Pulmonary functions and supervision of the Sleep and Pulmonary function laboratory. Performing Fiber- optic bronchoscopies and other procedures. Attending and participating in weekly grand rounds, journal club meetings and morbidity and mortality audits. Co- investigator in all the core departmental research projects and various drug trials that the department is involved with. To participate, coordinate and formulate the research activities of department of Respiratory Medicine and to work as participate in on call respiratory registrar roster. Specialist Respiratory Medicine Riyadh Medial Complex, a 1500 bedded General hospital the largest and state of the art Ministry Of Health training hospital of Kingdom of Saudi Arabia. Independently running the Chest Clinics of the hospital. Consulting on respiratory referrals and performing procedures for all the in-patients in hospital .Participating in the Respiratory and Internal medicine roster. Senior Registrar in Pulmonary & Critical Care Medicine at Sir Ganga Ram Hospital, New Delhi. Managing critically ill patients at intensive care unit. Attending to the emergency calls in the casualty & the wards. Carrying out all ICU procedures eg. endotracheal intubations, bronchoscopy, tracheostomy, ventilator settings, CPR, etc..
Residency in Pulmonology, at SMS Medical College, Jaipur (Rajasthan), India. Vast clinical exposure in a 260 bedded department .The range of clinical presentations included COPD, Lung Cancer, Asthma, Tuberculosis, Silicosis, HIV. Also actively participated in all departmental activities specially research and academics. Junior residency in Crtical Care Metro Heart Hospital, Noida, NCR, New Delhi in the department of Critical Care.